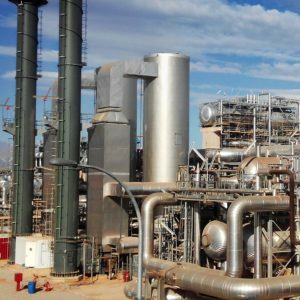 E & M Combustion has been awarded combustion equipment for the new Ashalim solar thermal plant in Israel, with an output of 121 MW, which will start operations in 2017 with an investment of 1,000 million dollars. The plant, called Ashalim Solar Thermal Power Station, will be located in the Negev desert and provide more clean energy to about 1.2 million households. This is one of the world’s largest such projects and will become the first solar thermal plant or Concentrate Solar Power (CSP) developed in Israel by GE and its technology partner BrightSource Energy. Ashalim solar thermal plant will have 5 boilers of 25 thermal MW manufactured by the Spanish company Sugimat. E & M Combustion is responsible for supplying three industrial burners model JBD-60,000-G, which run on natural gas, and two burners models JBD-60,000-GLO, that operate with diesel and natural gas. The five burners work with air preheated to 200 ° C and with a gas recirculation system (F.G.R.) for reducing NOx emissions below 100 mg / Nm3 in the natural gas combustion. The use of preheated air burners to substantially improving performance of the plant, but also increases emissions by increasing the flame temperature. The technical solution provided by E & M Combustion engineers avoid increasing emissions by implementing a flue gas recirculation (F.G.R.) system, which is achieved optimize combustion by decreasing the flame temperature, so that also decrease the NOx thermal. Within the field of renewable energies, E & M Combustion has a strong presence in the field of solar thermal power plants, in which Spain is one of the pioneering countries in both plants that combine technology tower and heliostat field and in the development of HTF technology plants. The new design of their burners 40,000 JBD-G is installed in solar thermal plants as Solacor I and II, Helios I and II and Solaben III and IV. The company recently installed its equipment in Bookport solar thermal plants in South Africa and in Central Nooro 1 in Morocco. GE is responsible for the engineering, the procurement and the construction (EPC) of the Ashalim solar power station and also provide services for operation and maintenance for a period of 25 years. In turn, BrightSource technology partner will deliver the heliostats and the control system of the solar field. Abengoa and the Israeli company Shikun & Binui closed in July 2015 the project financing of the Ashalim solar thermal plant with Overseas Private Investment Corporation and the European Investment Bank and local banks, such as Bank Leumi and Bank Hapoalim. Last spring Abengoa reached an agreement to transfer its 50% in the central Israeli background Noy and the Spanish group TSK. E & M Combustion is a company created in 2004 , and located at Artea, in Vizcaya estate, in the north of Spain. It specializes in the design and manufacture of industrial burners and combustion equipment through innovative technologies that enable low emissions . The equipment is designed and manufactured to adapt to the requirements of the plants of its customers and to reduce the energy use. The company operates mainly in the energy field, power generation , petrochemical and refinery , biomass and part of the food sector. E & M Combustion is present in more than 20 countries and gets more than 70 % of its production from export.